What is a Base Rate? The Base rate is the minimum interest rate bank charges from their clients while giving a loan. Banks can charge above the base rate. The base rate is used in place of Benchmark Prime Lending Rate. The base rate was introduced because there is no transparency in BENCHMARK PRIME LENDING RATE. So to make it fully transparent base rate is introduced. As per RBI guidelines, banks cannot lend money below the base rate. The base rate is calculated taking all risk factors into consideration. The base rate is fixed by the individual bank, so it will differ from bank to bank. Banks declare their base rates on the website to make lending more transparent. Banks have to revise base rate at least once every quarter or more than once a quarter as per convenience. 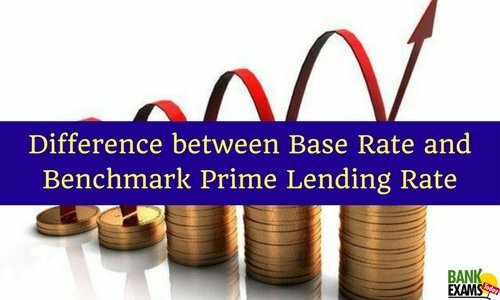 What is Batch Prime Lending Rate? Before, Benchmark prime lending rate, the prime lending rate was used to give a loan to customers. Benchmark prime lending is the rate by which banks charge their creditworthy clients. Banks can decide BPLR by unanimity of board members. RBI's REPO rate and CRR affect the benchmark prime lending rate. The BPLR is not a transparent, so sometimes bank could lend below the BPLR. And for that reason BASE rate was introduced. Sometimes bank would give a loan to big companies at lower BPLR rate than common people. Concept It is a new concept. It is an old concept. Replacement Before BASE rate, BPLR use for calculating interest. Before BPLR, PLR (prime lending rate) use for calculating interest. Transparency It is fully transparent. No transparency at all. Revision At least once a quarterly. No scheduled time for revision. Disclosure It is shown on bank website Not to disclose.